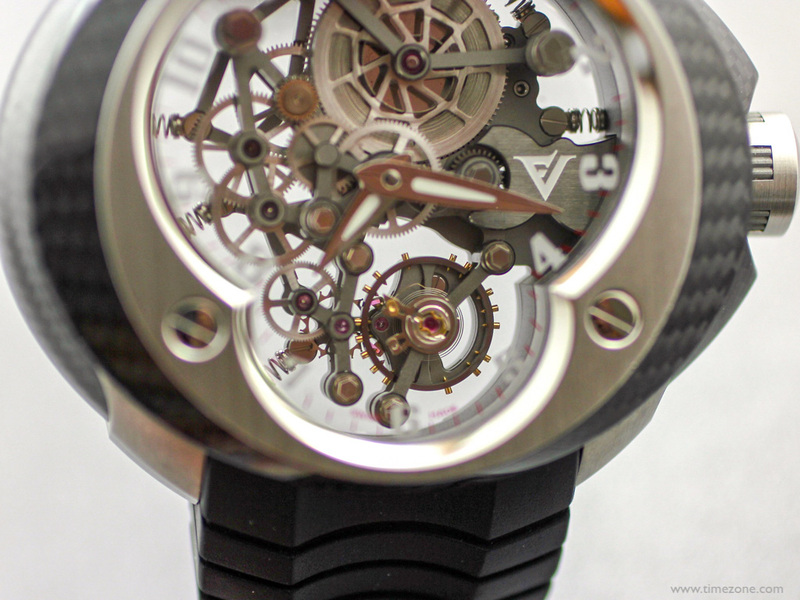 The FV18e Cobra Manual Suspended Skeleton is a time only, two-hand manual wind watch. 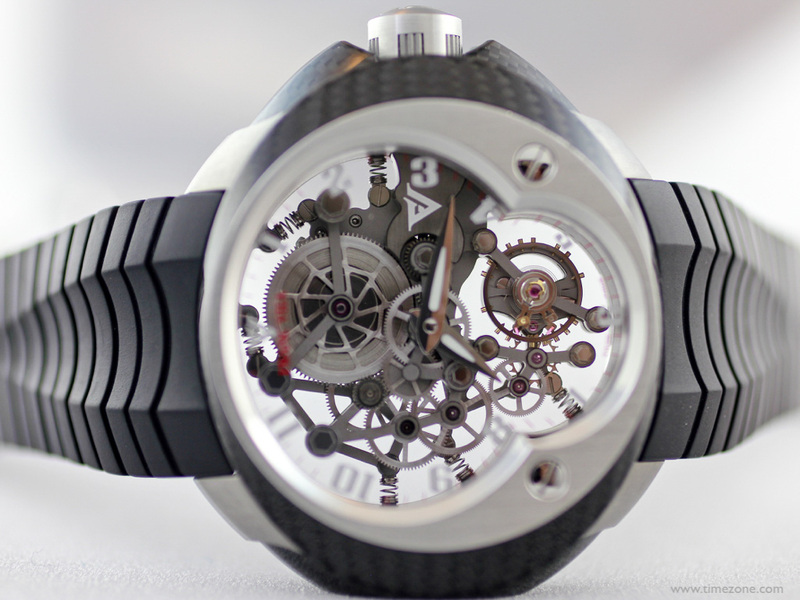 Yet, with its suspended skeleton movement, the FVe18 is anything but simple. Circles, elliptical shapes and two design screws are Franc Vila's signature design cues and the Cobra case is the firm's most iconic design. 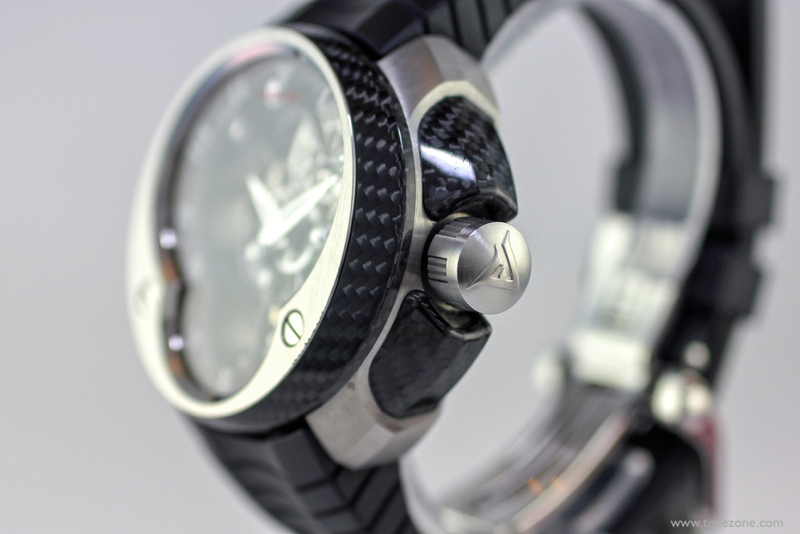 The Cobra collection derives its name from the shapely dial opening that evokes a cobra poised to strike. 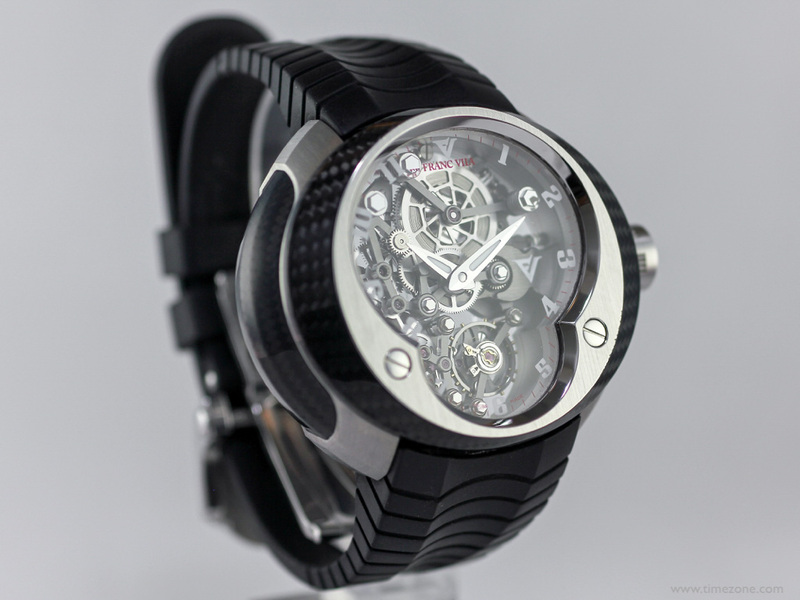 The oversized elliptical case measures 42.00 mm x 50.00 mm and is a complex construction of titanium, steel and carbon fibre. 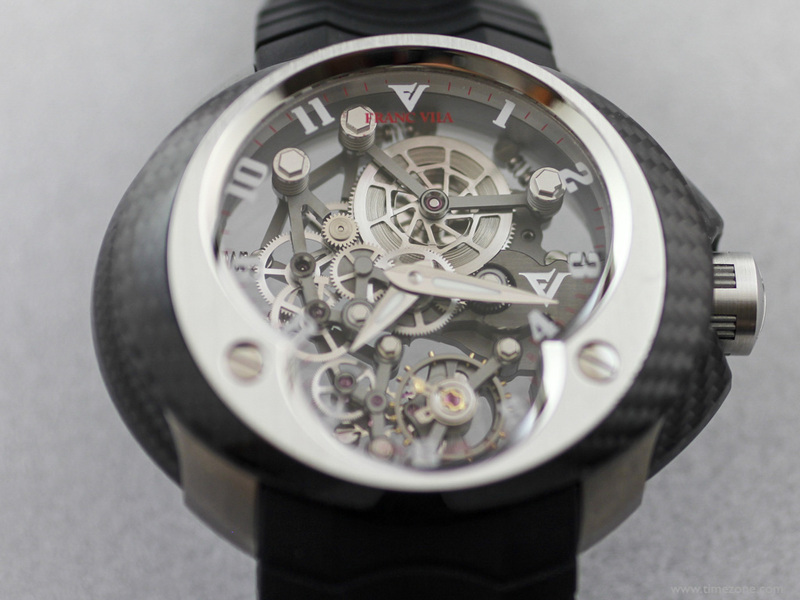 The case itself is carbon and is braced in-between a titanium case middle that doubles as the lugs. 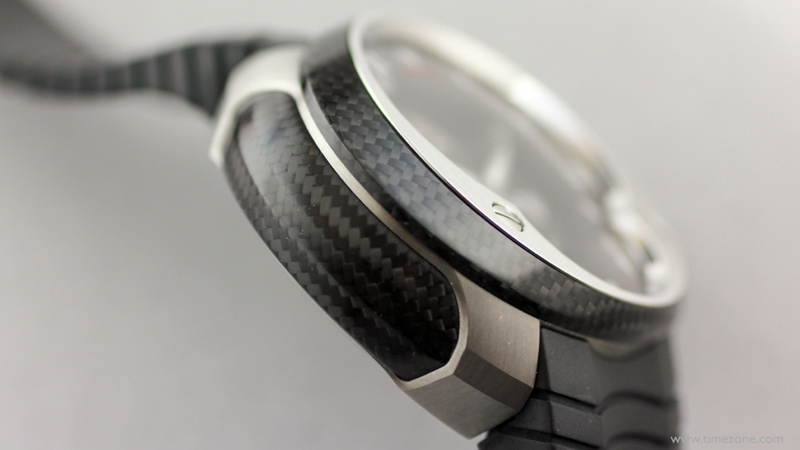 Both case parts are then topped by an elliptical carbon bezel embedded with a steel inner bezel. 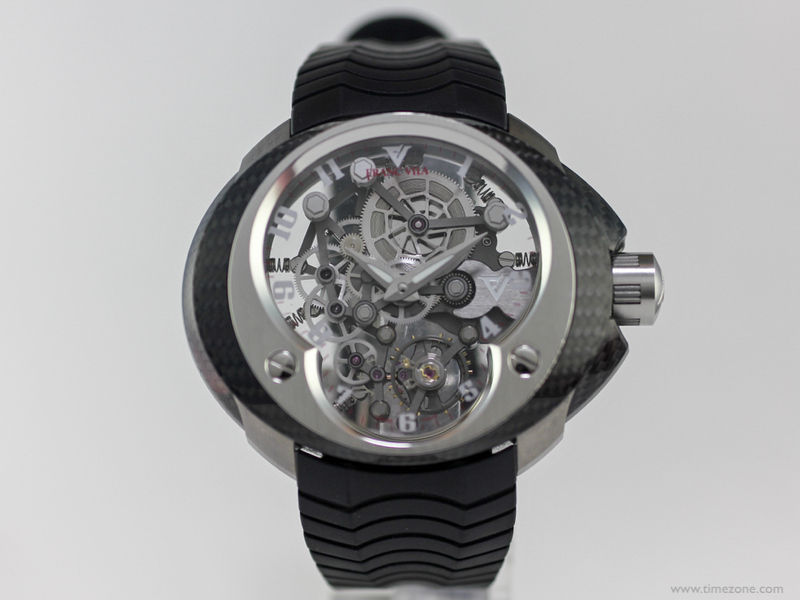 The case back is steel, the crown guards are carbon and the crown itself is a combination of titanium and steel. The sapphire crystals on the dial-side and display back are treated with an anti-reflective coating on both sides for an unobstructed view of the suspended movement. The FVe18 is water-resistant to 100 metres. 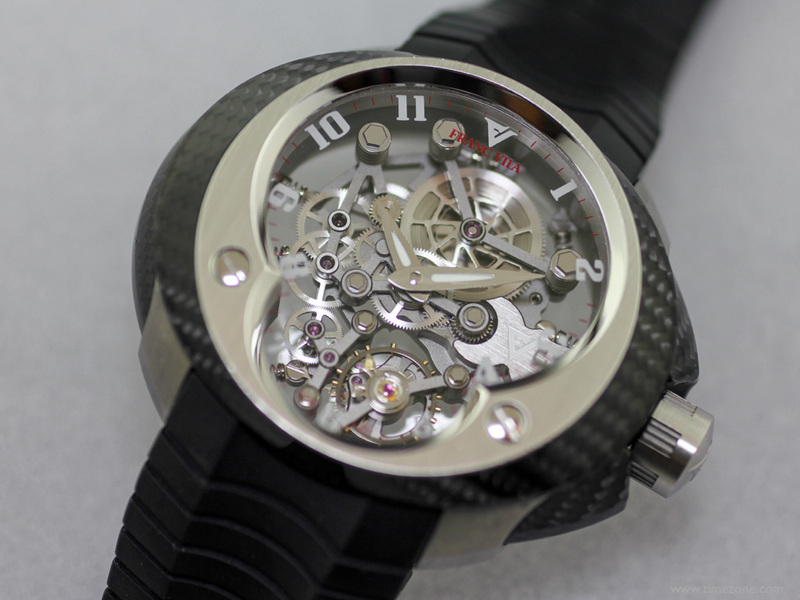 Franc Vila foregoes a dial to expose an openworked movement suspended at the center of the case. 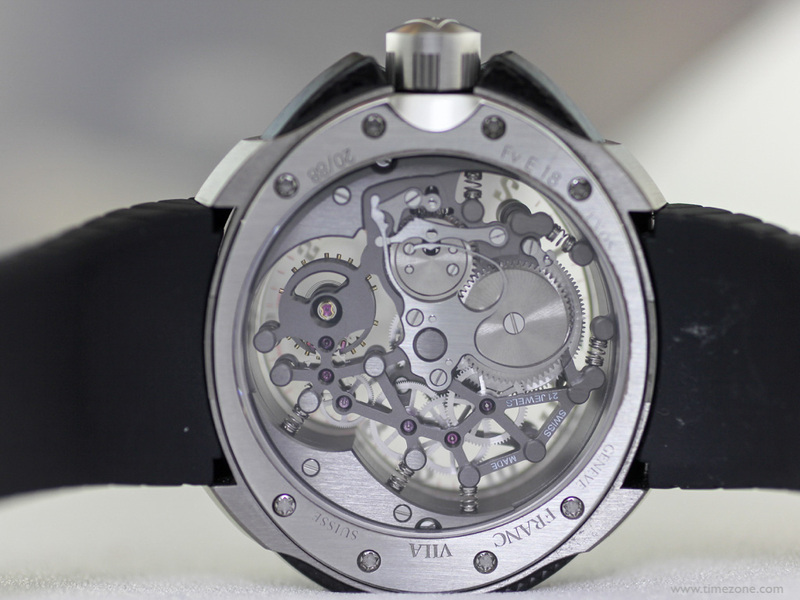 The Caliber FV18E is a 21-jewel, manual-winding movement made exclusively for Franc Vila by Dubois-Dépraz. 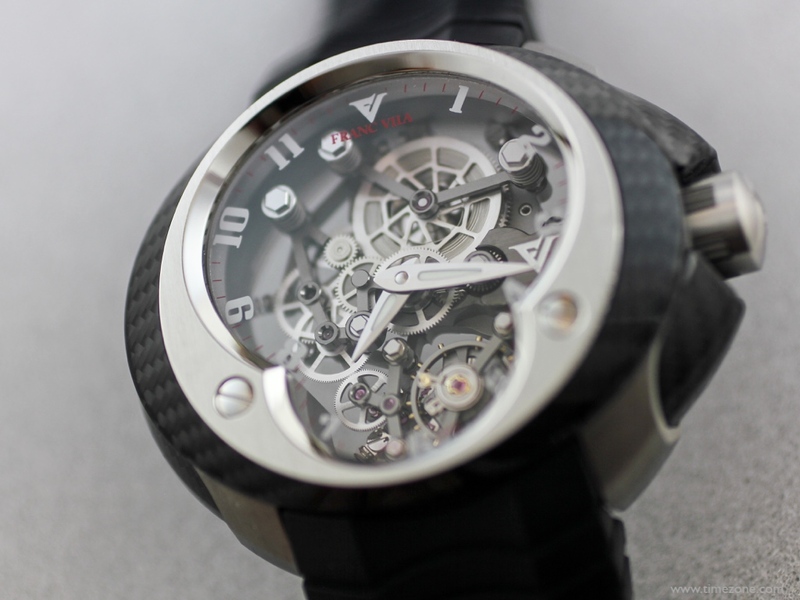 The movement architecture is visually striking with openwork plates and bridges that resemble the spaceframe chassis of a Formula 1 race car. 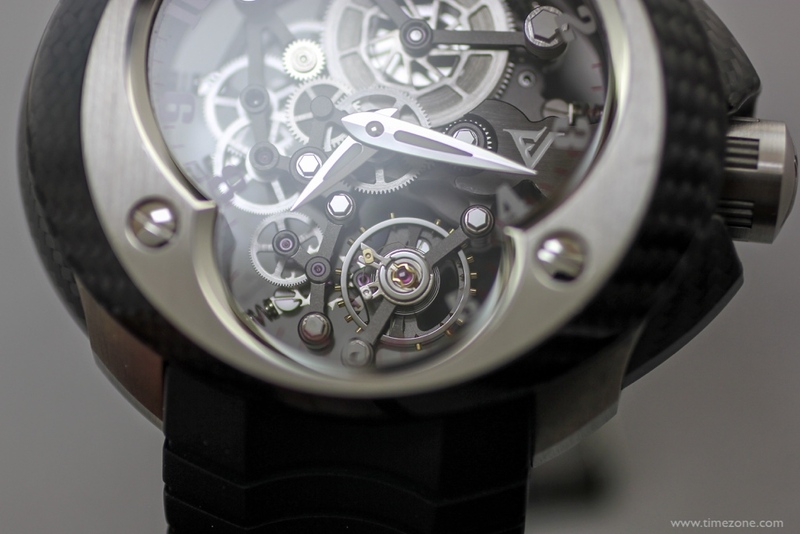 In lieu of watchmaking screws, the gear train and mainspring are fastened in place by hex bolts; in lieu of a main plate, the movement is spring-mounted to the inner case by six springs. The two most important principles in the design of a race car is to be lightweight and rigid. The FV18e taps into these racing principles with its lightweight case and suspended movement. The FV18e isn't thin, or elegant and ultra-lightweight like Richard Mille, which epitomises the racing and supercar ethos. But, the FV18e has its own über masculine appeal. 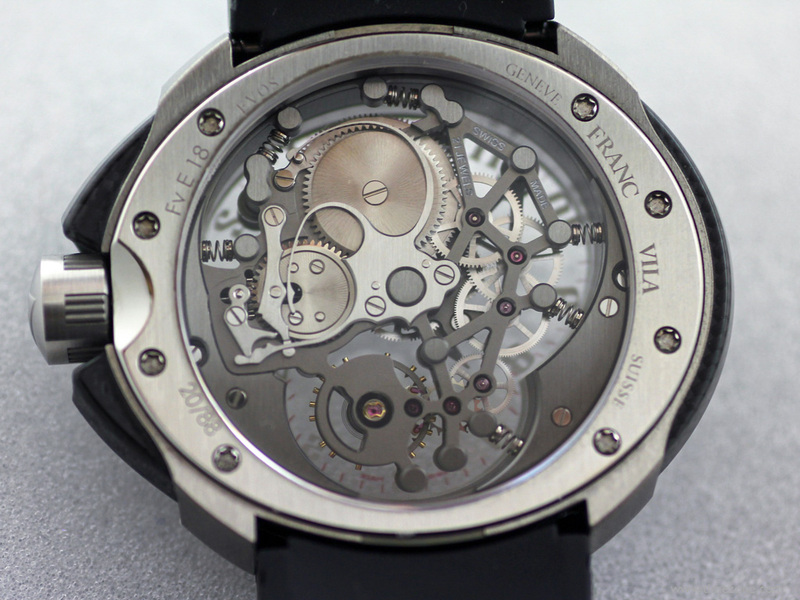 At rest and static, I can't help but notice that, again, Franc Vila uses an undersized movement in an oversized case. But on the wrist and animated, the FV18e is enjoyable to look at. 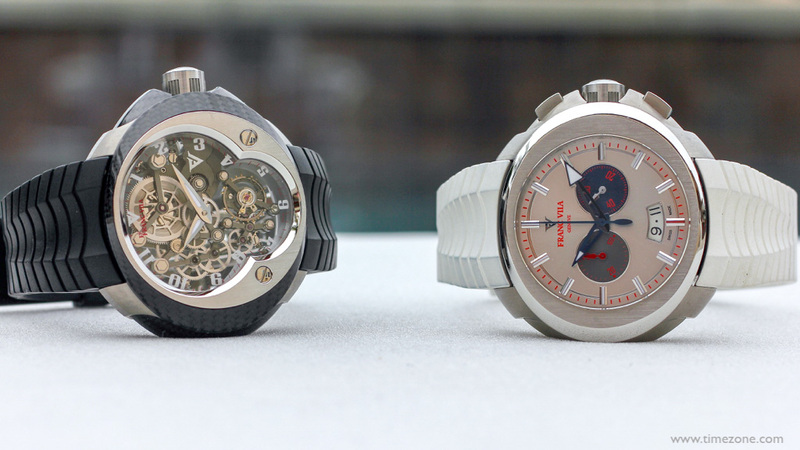 In exposing the balance and train wheels, the dial opening is a symphony of moving wheels and pallet fork. 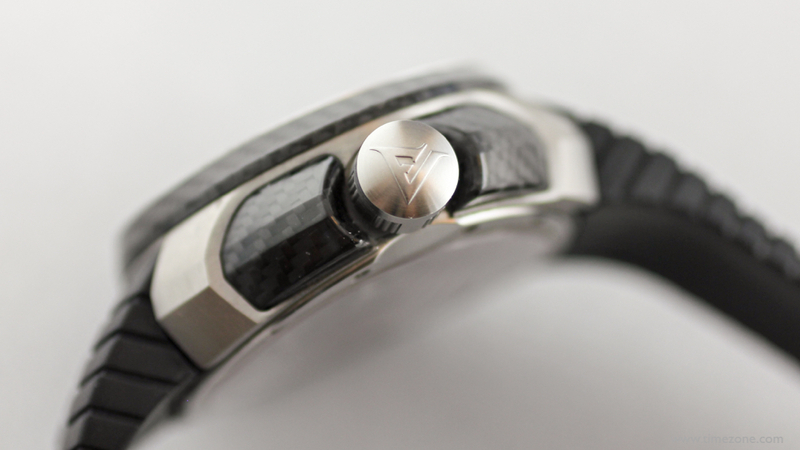 The FV18e is fitted with a rubber strap and steel deployant clasp. 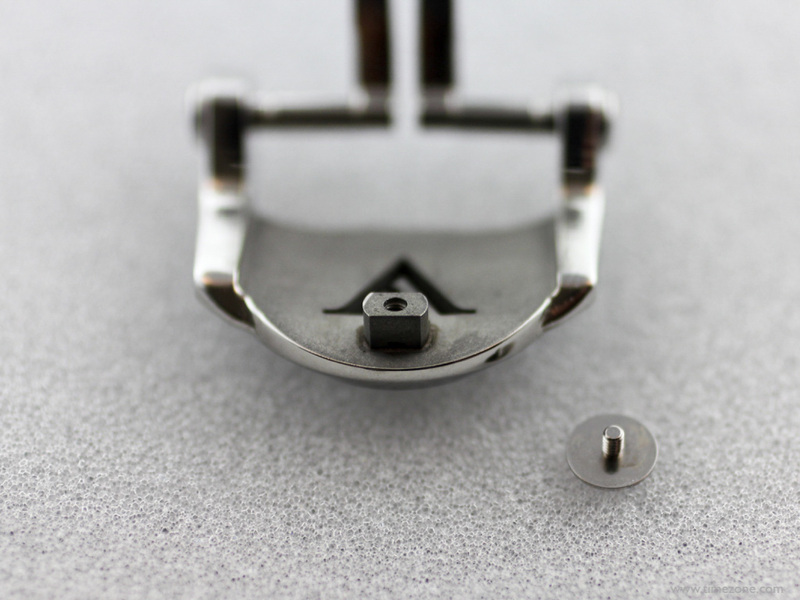 Once the deployant clasp is sized to the correct hole in the strap, a screw secures the clasp to the strap. 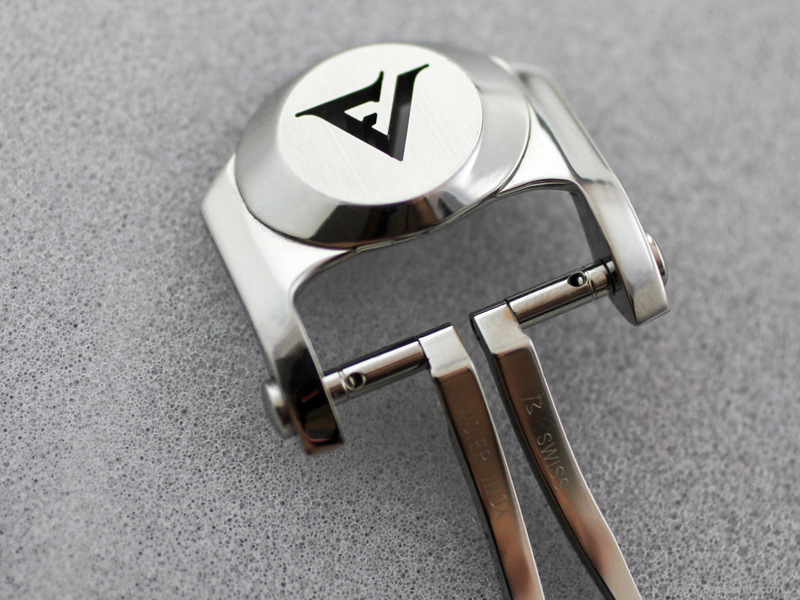 The deployant clasp is nicely finished with the brushed surfaces and polished sides, as well as a laser cutout of the "FV" logo. 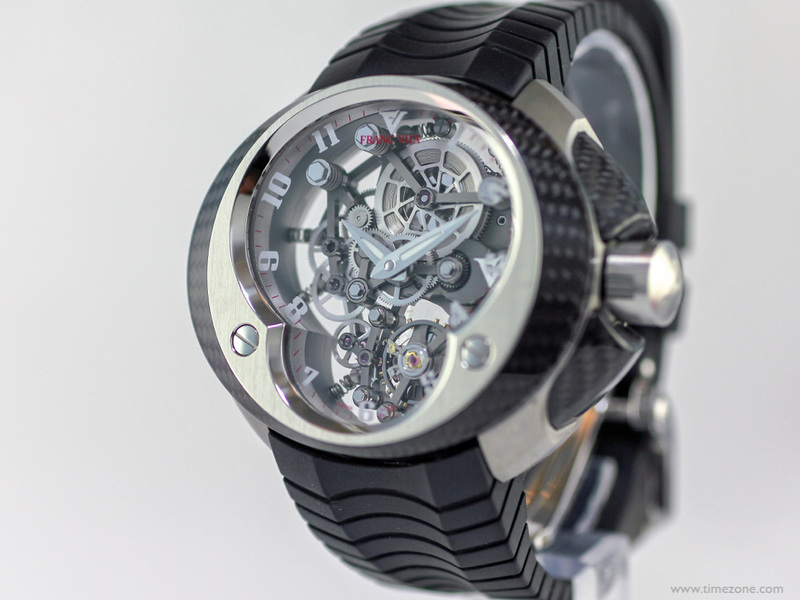 The FV18e Cobra Manual Suspended Skeleton is a limited edition of 88 pieces. Retail price is $32,500. 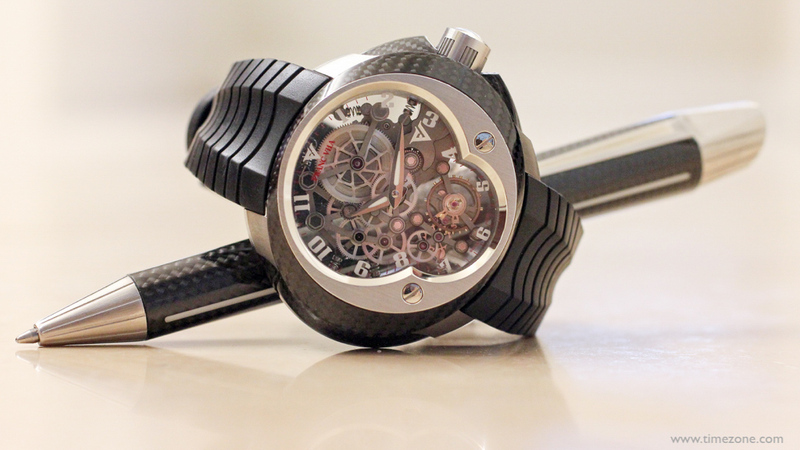 Again, the price is aggressive since the FV18e competes with other noteworthy watches like the Hublot Unico All Carbon, Zenith Skeleton El Primero and Audemars Piguet Skeleton Royal Oak 15305ST. Previous Topic: TimeZone GTG at Basel!